-Psycho II (1983) director Richard Franklin, in an interview for my book Horror Films of the 1980s (2007). Page 351. If Alfred Hitchcock’s Psycho (1960) concerns the “private traps” that people often make for themselves, then its impressive 1983 sequel -- directed by Richard Franklin -- focuses on what happens when people won’t let go of those traps. 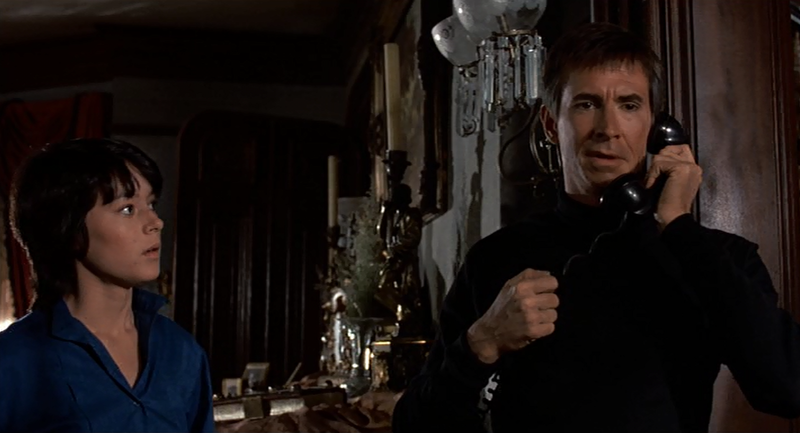 Not coincidentally, Psycho II involves a generation gap of sorts, since two protagonists (Norman Bates and Mary Loomis) are compelled to join their wayward parents (Lila Loomis, Emma Spool) in those aforementioned traps, with dire results. In this case, the will of the older generation is imposed violently on the younger generation, and the cycle of violence and madness continues because of it. In fact, that’s the image Psycho II leaves us with: madness re-asserted at the Bates Motel because the older generation can simply not live with the possibility of countenancing something new or different. Lila refuses to believe that Norman can be sane, and Spool succumbs to her madness to protect Norman, an act which re-awakens Norman’s own Mommy issues. In short, both Lila Loomis (Vera Miles) and Emma Spool (Claudia Bryar) wish to stick rigorously to their long-standing biases and preconceived notions, and even take (violent or subversive) action to assure the outcome that validates their viewpoint and desires. It is the children, however, who suffer for the sins of the mothers, and Psycho II is thus a story about the ways that families keep replaying the same dramas and reliving the same pathologies, one year to the next, one generation to the next. This sub-text adds some meat to the bones of the film, which -- while not revolutionary like its storied predecessor -- is nonetheless an extremely well-made thriller. 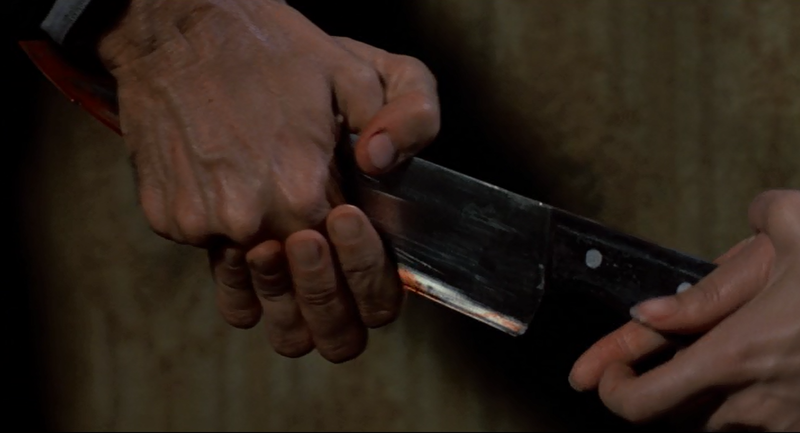 More than that, even, Psycho II is a compelling mystery featuring many effective and unexpected twists and turns. Also, it seems impossible not to read “the generation gap” sub-text of Psycho II as a pre-emptive defense of this sequel. Once more, we must consider historical context. The older, established movie intelligentsia was up in arms about a sequel being crafted to Hitchcock’s masterpiece in 1983. It argued, basically, that a sequel could only be more of the same: violent hijinks at the Bates Motel. Psycho II’s very story, its narrative content, seems to suggest otherwise. Indeed, one aspect of Psycho II that remains quite beautiful is the one alluded to in the quote above, from Franklin. This sequel beautifully expresses Norman’s tragic and innocent qualities. One spends the film wishing Norman some measure of happiness, but understanding that the cynical, caustic forces of the world will simply not let him have it. I love and admire the original Psycho for all the reasons I enumerated yesterday. I love how it plays with structure and shatters decorum. And I admire how it splits our point of identification, the protagonist, into three individuals. Without resorting to gimmickry or cheap tricks, the sequel really reveals to us Norman Bates as a human being who is worthy of our sympathy, not just as a surprising boogeyman. In so many ways, Norman really is like a lost “boy man” instead, and as this film points out, the world -- circa 1983 -- simply has no place for him. He is now not only a man out of his mind, but a man out of time, out of step with the present. Psycho II opened the same day as another sequel, Return of the Jedi (1983), but nonetheless succeeded at the summer box office, and paved the way for additional sequels, all of which continue more or less in the vein of Franklin’s film, not Hitchcock’s. The Psycho sequels are, essentially, character studies of a “lost boy” in the modern world, and the ways that society continues to fail him. I don’t believe, honestly, that the sequels would have succeeded to any creative degree if they had not adopted this grounded, character-based approach. 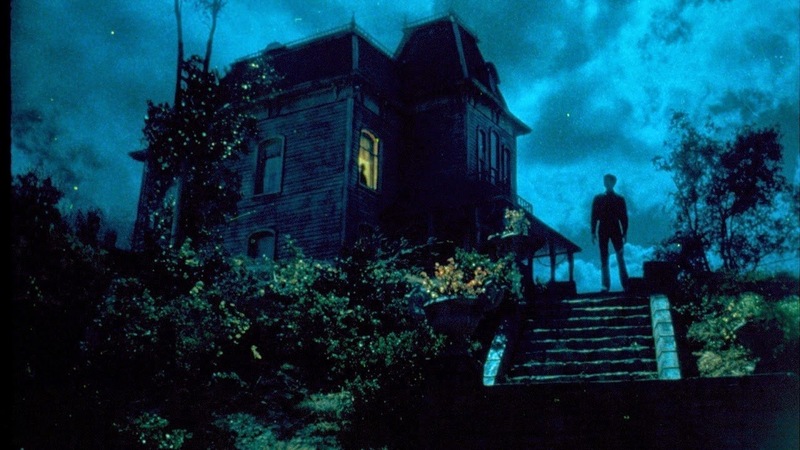 Psycho II turns the gaze of the camera squarely on Norman and the world of the 1980s. And in that view, it’s clear to audiences Norman Bates isn’t the only insane one. The world is “psycho” too (II). After twenty-two years in asylum, murderer and former mad-man, Norman Bates (Perkins) is released. At the hearing before his return to society, Lila Loomis (Miles) stands up and complains that the laws of the country protect the guilty, not the innocent, and that there is no justice for Norman’s victims. She warns that he will very likely kill again, and that when Norman does so, the blood will be on the court’s hands. Norman returns home to Fairvale with his psychiatrist, Dr. Raymond (Robert Loggia), and learns that the Bates Motel has been turned into an “adult” (pornographic) establishment by its manager, Warren Toomey (Dennis Franz). After taking a job at a local diner with kindly old Mrs. Spool (Bryar), Norman fires Toomey and decides to run the motel himself. 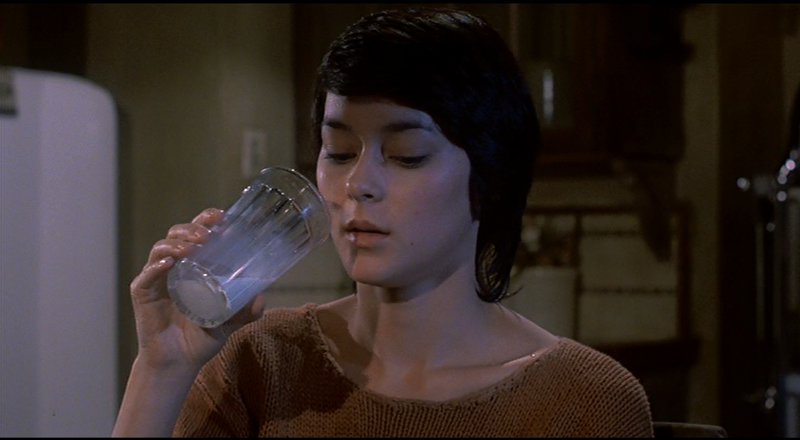 Norman also takes in a waitress from the diner, Mary (Meg Tilly), who is having relationship troubles. But the truth is that Mary is Lila’s daughter. Her mother has asked her to insinuate herself into Norman’s life and drive him crazy, wearing his old “Mother” garb, while Lila telephones him and claims to be the dead Mrs. Bates. 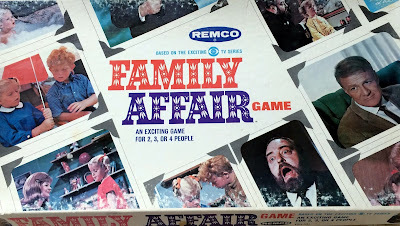 As Mary gets to know Norman, she sees how cruel her mother’s plans truly are, and begins to rebel against Lila and the strategy to de-stabilize Bates. 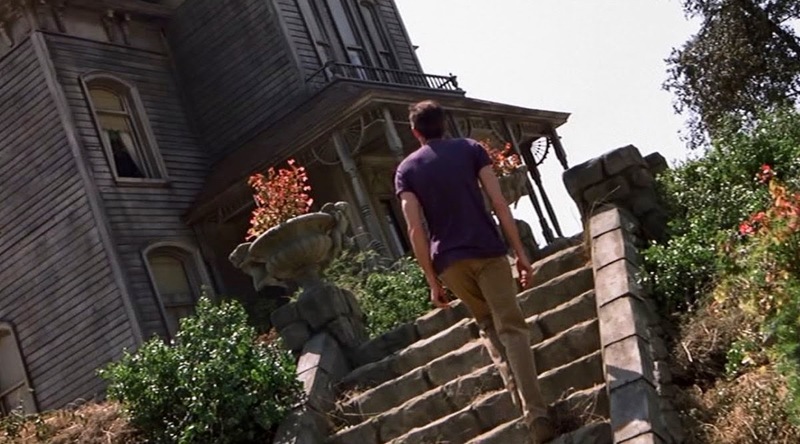 At one point in Psycho II, Norman experiences a flashback of his mother, Norma Bates, while standing just outside her bedroom. 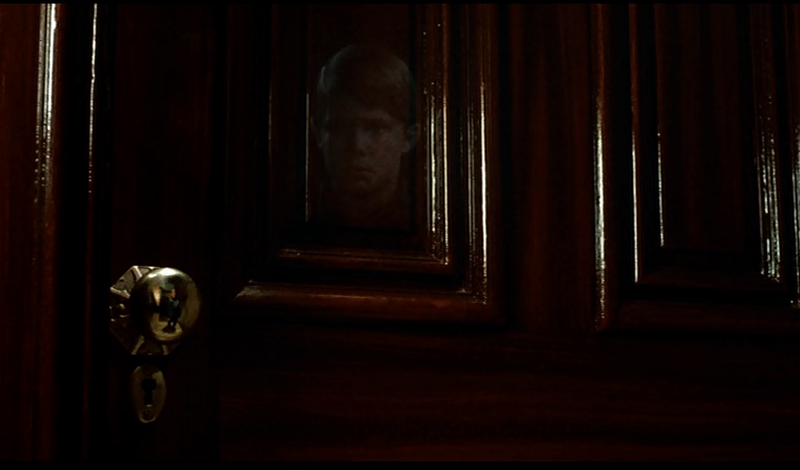 In the brass door-knob (and over it, in the door itself) we can see a distorted reflection of Norman, but in that reflection, Norman is not a grown man, but rather a child. That image, in many ways, is the key to appreciating this sequel. Norman is developmentally arrested and a virgin to boot, as Anthony Perkins and Richard Franklin have both pointed out. He lived in a fantasy world before being caught in 1960. But since 1960, he has been frozen in time and living in a bubble of a different sort. While exorcising the ghost of his mother, he has actually learned nothing of life. Thus when Norman is released in 1983, he is a fish-out-of-water, a victim both of his mother, and of the society which incarcerated him but never taught him how to live, or how to succeed. Norman returns to “real life” rudderless and without direction, with few friends, and many enemies. This situation makes him incredibly vulnerable. That vulnerability is ruthlessly taken advantage of. Mary Loomis is a victim in the same sense: a pawn in her mother’s twisted scheme to send Norman “over the edge.” This plan puts Mary in mortal jeopardy, but it also requires her to be a liar and deceiver. And it all must happen in the name of Mary’s aunt, the dead Marion Crane. Lila Loomis has been unable to forgive Norman for her murder, even after twenty-two years. In fact, Lila has become a cruel, strident person railing at everybody, including the legal system, for failing her. Lila is so consumed with rage and anger that she dresses as Norman’s mother to vex him, and calls him on the telephone and pretends to be Norma. There can be no argument about the fact that she acts deplorably. Never once does she allow for the possibility that Norman might be healed, or seeking some form of redemption. Lila simply can’t get beyond the past, and about what she “knows” to be true. Everyone else -- the law, the psychiatrist, and even her own daughter -- are wrong for thinking otherwise. Lila is thus a dead-ender, a person willing to believe things which are not true so as to validate her own hatred and prejudices. It’s a surprising and rewarding idea to turn our final protagonist in Psycho, Lila, into an antagonist in the film’s sequel, but is also speaks to a sad truth about people. They sometimes get brittle and inflexible with age. Psycho 2’s cleverness comes about, in a sense, from our conflicted feelings for Norman. He is heart-breaking when he talks about his mother making him toasted cheese sandwiches, and being good to him, and yet, we also remember the weight of history. We know he has killed and that, as I wrote above, that Norman is vulnerable. 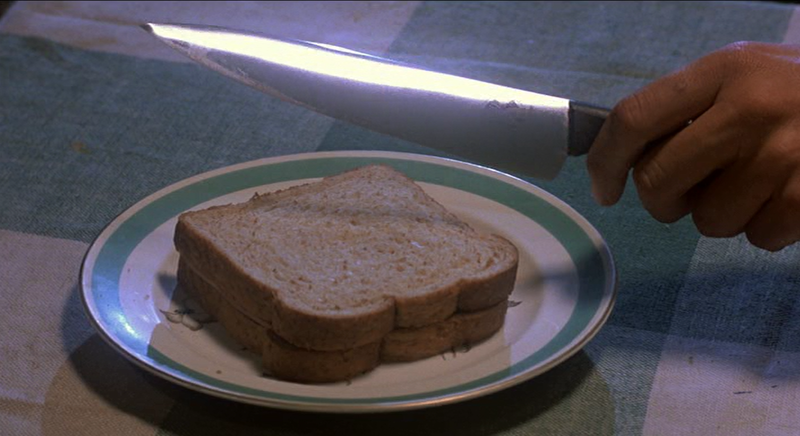 In one well-directed scene, Norman cuts a sandwich for Mary and the scene is alive and electric with tension. Mary hands Norman a very large butcher knife, and, remembering the past, he doesn’t want to hold it or take it. Mary -- in on the plan to de-stabilize Norman -- realizes that by handing the knife to him, she is putting herself in danger. And then, as audience members, we have to wonder about the moment too. Mary is handing Norman the tool that could be used to murder her! Who, finally, is responsible, when someone knowingly hands a former murderer a knife? Is Norman responsible for his actions? Or is it Mary? And does the fact that Norman does not succumb to violence mean that he is, in fact, cured? Psycho II asks us to consider all these ideas. Another great scene occurs near the film’s climax. Norman attempts to disarm Mary, but she is holding the knife. He keeps approaching her, hands outstretched, and she stabs him, and cuts his hands. At this point, it is not Norman who is acting violently, but Mary, driven to rage by her mother’s death, who does the stabbing. This is a neat inversion of typical horror movie tropes. Here the “boogeyman” is unarmed and pleading, and the final girl, Mary, is losing her grip on sanity and drawing blood. In terms of style, Franklin is a Hitchcock protégé, and so Psycho II features many moments as elegant and frisson-creating as those I enumerate above. Some moments in the film are also downright shocking, even today. Lila takes a knife to the mouth (and through the mouth), and the violence is, in its way, decorum shattering too. Here a sweet old woman (and our former protagonist) isn’t just killed, but tactlessly butchered! 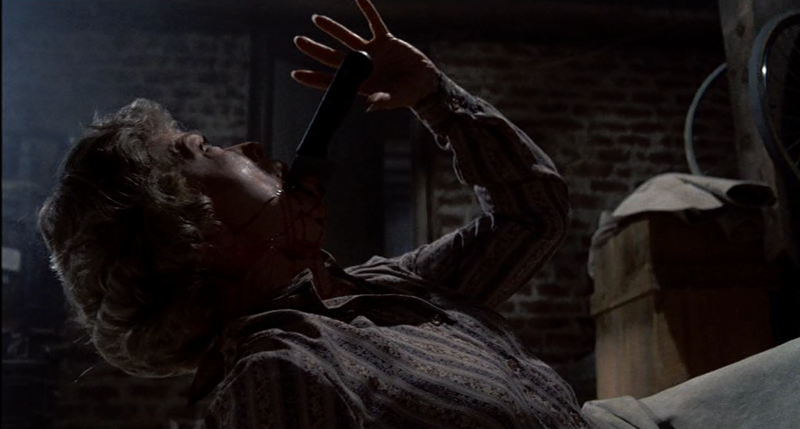 Before she dies, Franklin provides a close-up of Lila's mouth, screaming in horror, and the shot should look familiar from Psycho. In this, in set design, and in fidelity to the characters, Psycho II seeks to honor its predecessor without slavishly imitating it. 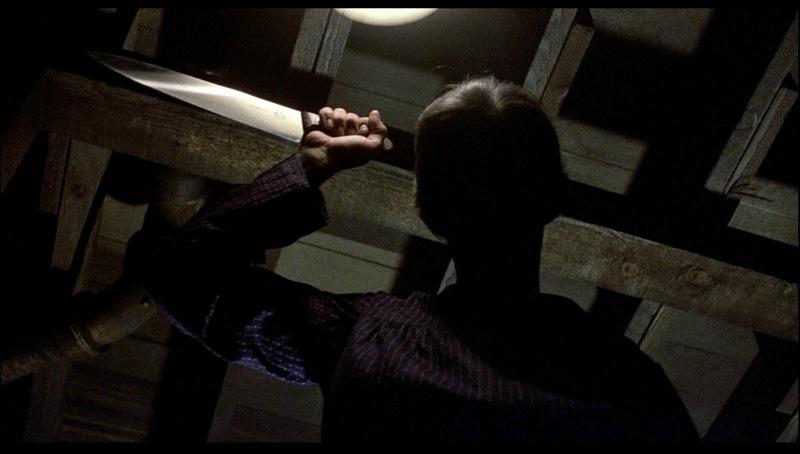 I wrote about this some in Horror Films of the 1980s, but Psycho II is really about Norman making a choice. Should he choose the sanity that society prefers, or, finally, the love of a (psychotic) mother figure? On one hand, society makes it clear it doesn’t want Norman. Lila frames him. The sheriff suspects him of killing two teenagers. And Mary, even, betrays him. In broader terms, cut-backs in social services mean that Norman is never visited by a social worker, someone who can help assimilate him back into the mainstream. The great thing about Psycho II is that Mother’s comment -- while horrifying -- also happens to be absolutely true, given what we’ve seen of mainstream society in the film. If his only choice is between a world that hates him and a mother who is steadfast (but nutty…) then love wins out, every time. 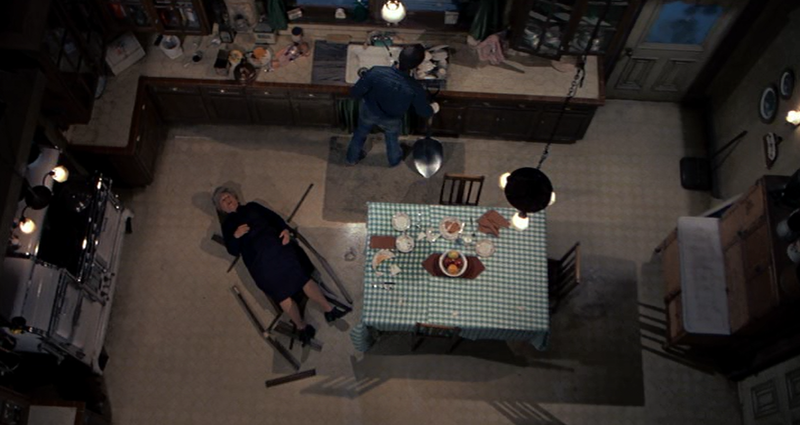 Psycho II’s last moment is perfectly conceived and executed. 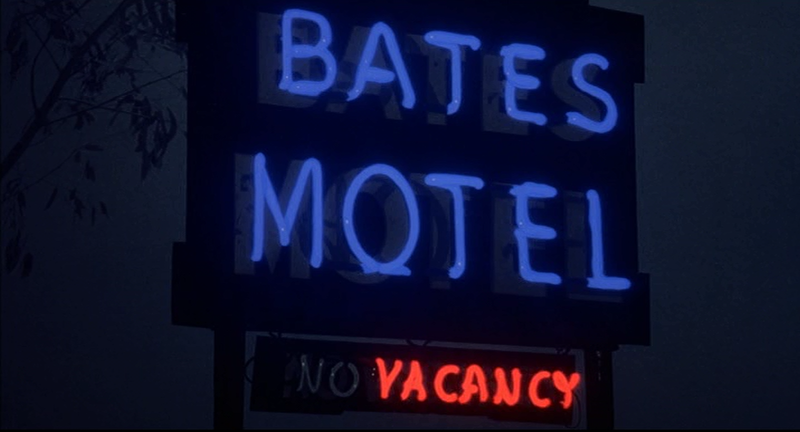 The vacancy sign turns on at the hotel, storm clouds roil in the night sky above, and Norman stands in the shadow of that Gothic house, in the shadow, again, of his mother. For Norman, this is a return to madness, and some might even say it’s a reset of the Psycho franchise, taking us back to the world as it was before Marion’s visit in 1960. But really, it’s the only logical destination for Norman, the lost “boy man.” Another shot in the film goes even further in depicting his plight. We see Norman banging on the attic window of his house, locked in and unable to escape. He sees the world outside, but can never quite get to it. That’s Norman in a nut-shell. Norman’s just not getting out of the “private trap” the world has made for him. But tragically – and quite unlike Lila or Emma – he really, really wants out. 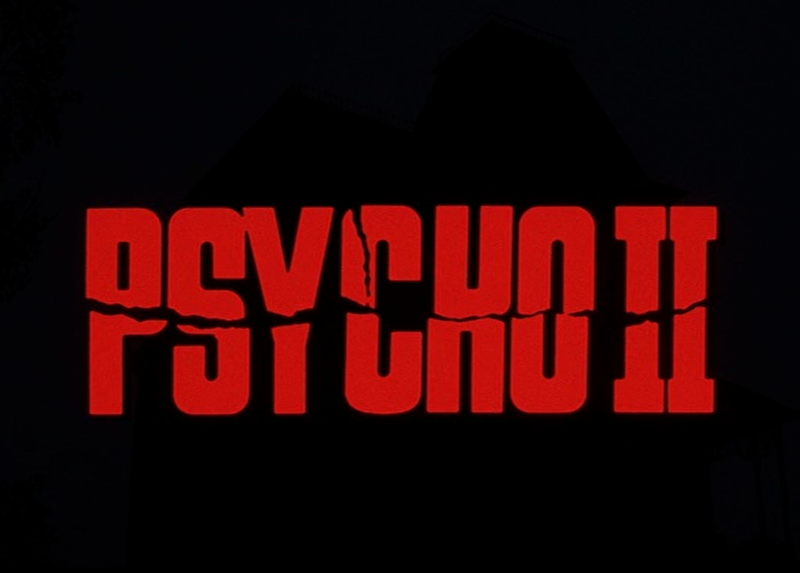 Tomorrow morning: Psycho III (1986). 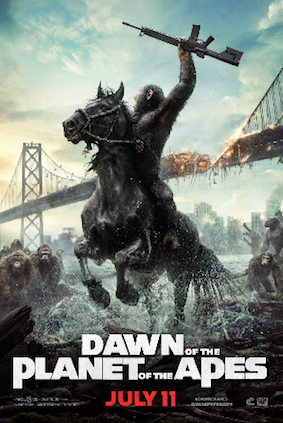 Still remember the hate that accompanied this film upon release. Totally unjustified I feel. And Merg Tilly was the most criminally underused actress of the past century.